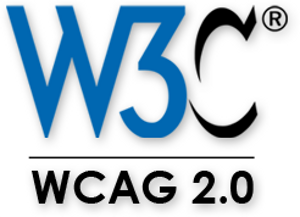 E - accessibility: Creating a website fully confortant with WCAG 2 offers a wide variety of advantages both for your company, your visitors and your potential customers. Developing a website confortant with current accessibility guidelines will function correctly in all internet technology, both now and in the future. This will save you time and money: Re-developing your web site after a few years or each time some new technology appears will not be necessary. Your search engine rankings will radically improve. The more accessible your web site is for your visitors, the more accessible it will be for search engines. WCAG confortant web sites contain more search engine readable content. Accessible web sites use less code; Do not use flash, have fewer images and generally less ‘bloat’, so your site loads faster for all visitors. A happy visitor soon becomes a happy customer. Advertising the fact that you have considered all aspects of accessibility will serve you well in all aspects of public relations. Several govenrments both in the E.U. and the rest of the world are willing and able to offer a strong subsidy in order to turn web towards a more accessible direction, protecting people with disabillities from discrimination and improving web pages usability for everyone.